Celebrate the Festival of Lights this year with our custom photo Hanukkah cards. MyPix2 offers multiple card designs that you can personalize with your own photos and greetings. Upload your Hanukkah photos from last year or a series of snapshots from your phone and get creative. Photos are the best way to share your most cherished moments with loved ones. 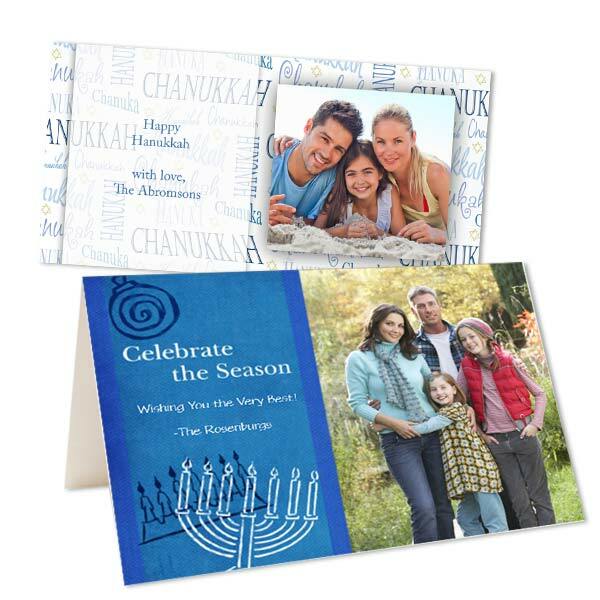 So, why not create a greeting that features your favorite memories for a Hanukkah card that truly comes from the heart. In addition to multiple card templates, we offer three card options printed with the highest quality inks! Order glossy photo paper cards for the clearest photos and boldest colors. Or, go with our double sided photo cards for a professional look. No matter which style you choose, you can print your own Hanukkah greetings and expect the highest quality results without breaking the bank!